Blanch broccoli florets and carrots in a pot of salted, boiling water for about a minute. Drain and leave to rest while preparing other ingredients. Heat up non-stick frying pan over medium heat and spray lightly with some olive oil. Cook bacon until crispy. Set aside and pat with a paper towel. 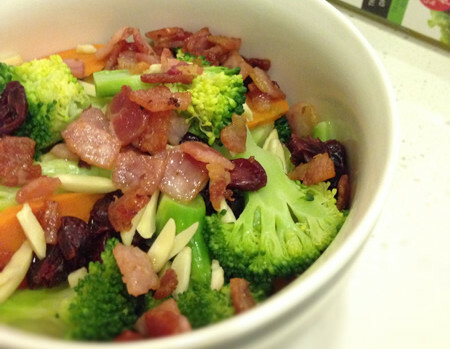 In a salad bowl, combine broccoli, carrots, slivered almond, onion and craisins. Drizzle over with Red Kellys Traditional Dressing and toss until dressing is well mixed. Season with salt and pepper (and more dressing if desired). Top with crispy bacon before serving. Enjoy! Tip: This salad is best enjoyed after it had been refrigerated for a couple of hours (covered with plastic wrap).